Track Mailgun events from the utilities section. This plugin requires Craft CMS 3.0.0 or later and Mailgun 1.2.0 or later. To install the plugin, either install via the plugin store or follow these instructions. In the Control Panel, go to Settings → Plugins and click the “Install” button for Mailgun Events. As the plugin uses your Mailgun settings as defined in the email settings section, there's no need to provide your API credentials again. Upon successful installation you will be able to choose which events to track and how many results you would like to request from Mailgun. accepted Mailgun accepted the request to send/forward the email and the message has been placed in queue. clicked The email recipient clicked on a link in the email. Click tracking must be enabled in the Mailgun control panel, and the CNAME record must be pointing to mailgun.org. complained The email recipient clicked on the spam complaint button within their email client. 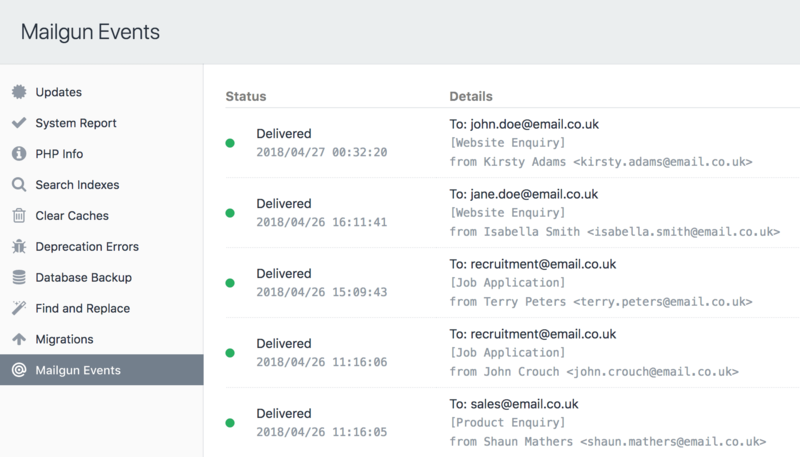 Feedback loops enable the notification to be received by Mailgun. delivered Mailgun sent the email and it was accepted by the recipient email server. failed Mailgun could not deliver the email to the recipient email server. opened The email recipient opened the email and enabled image viewing. Open tracking must be enabled in the Mailgun control panel, and the CNAME record must be pointing to mailgun.org. rejected Mailgun rejected the request to send/forward the email. stored Mailgun has stored an incoming message. unsubscribed The email recipient clicked on the unsubscribe link. Unsubscribe tracking must be enabled in the Mailgun control panel. From the plugin settings page you are able to choose from a list of predefined values, but you can set your own value by overriding the plugin settings. If you create a config file in your config folder called mailgun-events.php, you can override the plugin’s settings in the Control Panel. Since that config file is fully multi-environment aware, this is a handy way to have different settings across multiple environments.